The S9300 operates on the Versatile Routing Platform (VRP) operating system developed by Huawei and adopts the hardware-based forwarding and non-blocking data switching technology. 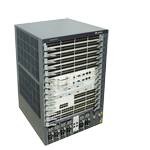 The S9300 features carrier-class reliability, line-speed forwarding capability, perfect Quality of Service (QoS) mechanism, service processing capability, and good expansibility.The S9300 provides rich enterprise network features, including firewall, Network Address Translation (NAT), network traffic analysis, IPSec VPN, and load balancing, meeting requirements of various services on enterprise networks. The S9312 supports a maximum of twelve 12 Line Processing Units (LPUs). The dimensions of the S9312 are 442 mm x 476 mm x 663.95 mm (width x depth x height). Facing the chassis, the LPUs, SRUs, CMUs, and power modules are mounted from top to bottom. Ventilation and heat dissipation of the S9312 are performed from the back of the chassis. The handles are on both sides of the chassis. The board cage of the S9312 provides a total of 14 slots for horizontally inserted boards. The two slots in the middle are reserved for the SRUs that support 1+1 backup mode. The other 12 slots are reserved for the LPUs. The fan frame and air filter of the S9312 are located at the back of the chassis. The power modules support PoE. The PoE function supports only the AC power supply. Four AC power modules work in 3+1, 2+2, or 4+0 (not backup) mode.. Located at the bottom of the chassis, the CMUs work in 1+1 backup mode. Table 1 lists the types of interfaces on the boards with high interface density and describes the interface density of the boards and in the entire system. On the S9300, the hardware completes two-level packet replication to forward multicast at wire speed. That is, the SFU replicates multicast packets to the LPU, and the forwarding engine of the LPU replicates the multicast packets to its interfaces. The S9300 adopts a distributed structure, which guarantees the separation between the data plane and the control plane. It provides a security performance leading in the industry. Whitelist: The S9300 provides a high-priority channel for the protocol packets transmitted to the CPU. The S9300 complies with Electro Magnetic Compatibility (EMC). The modular design of theS9300implements EMC isolation between boards. The S9300 meets the requirements for the high reliability of carrier-class and high-end devices. TheS9300provides the following features shown inTable 3to ensure high reliability.